It’s always Shark Week when you drive a BMW 6-series, and today’s Nice Price or Crack Pipe 633CSI brings both its shark nose and a seemingly excellent overall condition. Will that be enough to ensure its price doesn’t have you seeing red? How was your weekend? Mine was great and ended with lobster for dinner last night. Yum. The weekend kicked off pretty well too - all the way back on Friday - with a lively discussion of the merits of Space 1999 a 1999 Porsche 911 Cabrio and its thirteen-five asking price. Dunned for a triple whammy of potential negatives - it’s saddled with a Triptronic; it’s the more floppy convertible version; and its overall 996-ness - it still managed to earn a 55% Nice price win. That was because despite all that, it’s still a freaking Porsche 911. Another German who can seemingly do no wrong is Sabine Schmitz. She’s awesome, but of course we’re here to talk about cars and not the folks who wring them out on the Ring. Today’s 1982 BMW 633CSI is a car that’d probably be happier cruising on the Autobahn than having Sabine flogging it through the Karussell, but what we need to decide is whether this low milage example is priced well enough to make it a decent value for either of those two options. A funny thing about the E24, as we’ve noted in previous discussions, is that despite only subtle differences in the looks department, the 1976 - 1989 model run is actually split into two very different cars underneath. The early models - ’76 through mid-’82 - are based on the E12 5-Series platform while the second half of the run sit onunderpinnings borrowed from the more modern E28 sedans. To make matters even more confusing, the 6-series shared a lot of its styling tropes - nose, tail lamp shape, swage-line, and overall round-i-ness - with the E23 7-Series. The best way to tell which 6-Series you have is by the front fenders. The earlier cars have an inch or so of space between the swage and the arch, while the later cars lay it on the line… er, the line rests right on top of the arch. This one appears to be an E12-based car based on that, as well as its front-mounted antenna and three-round gauge dash cluster. It also looks to be in pretty much excellent, party time condition. The car has a claimed 79,000 miles on the clock and also appears remarkably clean both inside and out. That outside is presented in Cinnibar Red and comes with a snazzy body-colored spoiler on the boot lid. It rides on a set of reconditioned Bottle Caps (thankfully not TRX wheels), and has big ‘ol bumpers front and back, this being a U.S. edition. With that red exterior you’d naturally expect the interior to be… well, maybe not blue, but that’s what it is. Pop a quartet of albinos in there and you’d have the most patriotic car pool on the planet. The seats and dash look to be in good shape, however the carpet, which apparently was once blue, is now faded to a shade of green that makes it look like there was a leprechaun knife fight in there. Some additional kibbles and bits that may need attention include a recalcitrant electric radio aerial, and a tool kit that’s only 95% complete. Mechanicals - that’s a 181-bhp M30 SOHC straight six and a five-speed stick - are claimed to as well be in excellent shape. If memory serves, that five-speed has a dog-leg first which can take some getting used to. Another thing you might need to get used to is this car’s price, as at $13,800 it’s at the high-end of the non-M6 E24 range. Hell, it’s even $300 bucks higher than Friday’s Porsche! Of course these are now well into classic status and as the cheap crappy ones fall by the wayside, the excellent ones as this appears to be will become even more sought after. 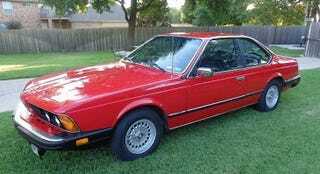 What’s your take on this 633CSI and its $13,800 price? Is that a pretty good deal for a shark attack? Or, does this car’s price make it a fish out of water?